Ensemble Studios may soon be closing shop, but before their doors for the final time they've got one last hurrah to give as Microsoft have announced their upcoming RTS, Halo Wars, has officially gone gold. According to Ensemble Studios founder Bruce Shelley, work on all non-Halo Wars related games were dropped in August so the entire studio could focus on finishing the game. In anticipation of the launch of Halo Wars, Lead Designer Graham Devine has put together a video documentary series that will explore defining themes of Halo Wars and give viewers a behind the scenes look at the game’s development and some of the people involved in its creation. The premier episode captures key elements that frame Halo Wars gameplay: the controls, perspective and strategy. The Halo Wars video documentary is available for download on Xbox LIVE and can be viewed at http://www.xbox.com/en-CA/games/h/halowars/. 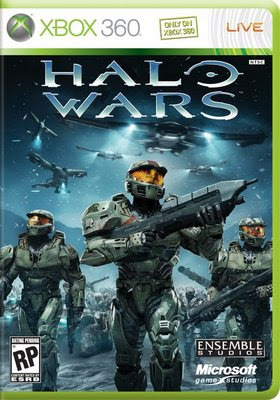 In addition, the recently announced Xbox LIVE demo for Halo Wars will be available on February 5 on Xbox LIVE in Canada. In the demo, players will be able to test the control scheme in optional beginner and advanced tutorials or jump right into the action to experience the beginning of the Halo Wars story with the first two campaign missions. The demo will also include “Chasms,” one of Halo Wars’ 14 multiplayer maps, wherein players can battle it out in Skirmish mode vs. A.I., playing either as the UNSC with Captain Cutter’s leader powers, or as the Covenant with the Prophet of Regret’s own unique abilities. Halo Wars will also come in two editions - the $60 Standard Edition and $80 for the Limited Collector’s Edition, which includes early access to the Halo 3 Mythic Map Pack. The game is expected to ship on March 3, 2009. Me wants. Me wants it now. I'm a huge fan of PC RTS games such as Starcraft and Command & Conquer, so I'm eagerly awaiting this title. I'm still waiting to play an RTS on console that can match the ease-of-use of using a keyboard. Maybe Halo Wars will be that game? As much as I try....I just can't bring myself to care about this game.